Easily capture live candidate answers and rich interview data from natural phone conversations. Relaxed-fit phone interviews for recruiters and job seekers. As simple as a regular phone screen, with incredible upside. Ask impromptu questions or use a custom interview script. Capture candidate’s interview answers in real-time. After the call, easily share audio highlights with team members for collaborative hiring decisions, without misinterpretation & bias. Experience how Hiring Managers can quickly review a candidate’s personality, communication style and domain expertise to remove redundant phone interviews and accelerate the interview experience. We’re introducing a new option. Hiring Managers can allocate 30 seconds, instead of another 30 minute conversation, to identify the best candidates and get them on-site sooner. Timing is everything in the talent acquisition business. Simply set your availability and start inviting candidates to interview. Candidates can choose from a few open times in your calendar… or if you would rather send them a specific time, our platform handles that too. Eliminate the typical back and forth that so often plagues the interviewing process. After all it’s all about timing in this business…s. 95% of a typical phone interview can get lost in translation. With the Honeit platform, you’ll interact with our simple to use yet powerful interview dashboard to capture all that rich interview content that would otherwise be lost. Upload custom interview scripts, tag questions as you ask them, and add notes to candidate responses. After your interview, Honeit let’s you easily generate sharable highlights from your interviews that you can send to hiring managers, team members, and clients. Choose the all the best parts of the interview and simply click a button… Let your candidates truly speak for themselves! The Honeit Chrome Extension is now live in the chrome app marketplace and allows for easy ATS integration. 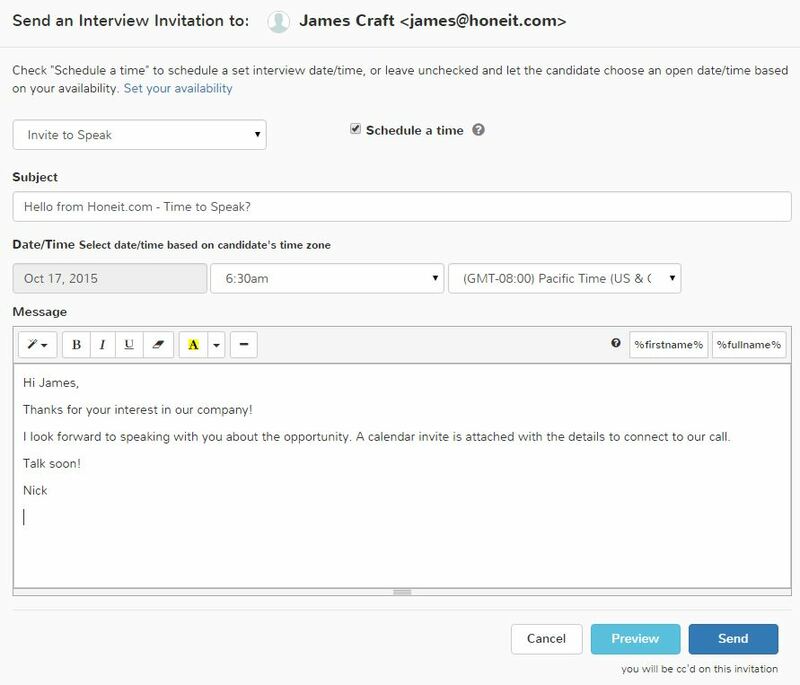 With the click of a button you can quickly send interview invites or interview confirmations without leaving your existing Applicant Tracking System (ATS) or Candidate Resource Management (CRM) system. 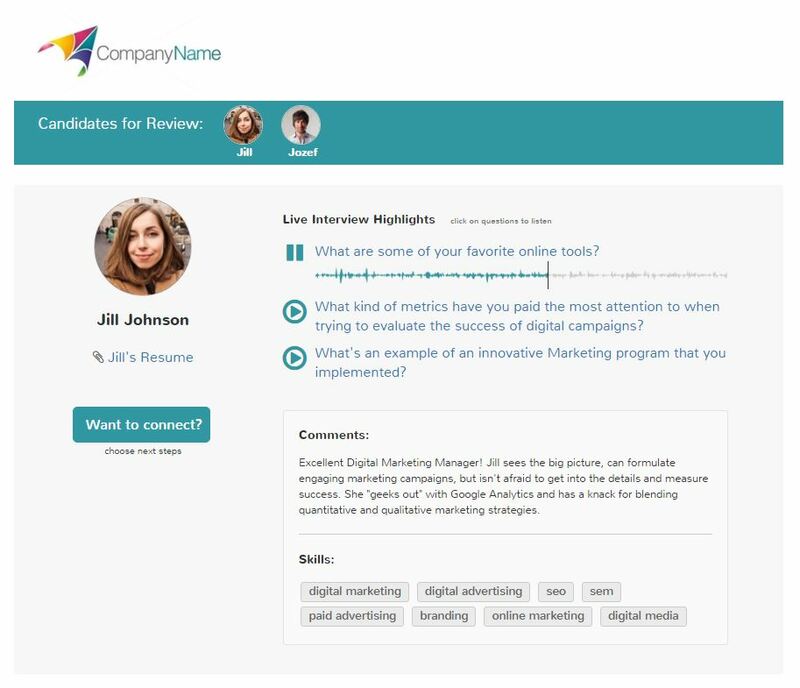 Easily share candidate interview highlights with hiring managers and clients. Select the candidates you want and the highlights you need and we’ll generate a branded email and landing page with your selections. Sharing couldn’t be any easier or more straight forward!